Mathematics and Christmas: Keeping Students Engaged! It’s that time of year again! Last year I wrote a series of blog posts to encourage teachers to continue to provide rich teaching and learning activities until the very end of the school year. I thought it would be a good idea to repost these activities for those who might want a reminder of some engaging Christmas themed mathematical explorations. As the end of the school year approaches, report writing is almost complete and Christmas is on the horizon. It’s easy to lose focus, get distracted, and keep students occupied with ‘busy work’. However, it’s critical that we don’t waste a minute of students’ learning time, particularly when we know that over the long Christmas break some students may regress in relation to mathematical fluency and understanding. So how can you keep mathematics engaging until the last day of school? Consider the elements required for sustained engagement to occur. Three factors are critical: cognitive, operative, and affective engagement. In terms of mathematics, true, sustained engagement occurs when students are procedurally engaged and interacting with the mathematics and with each other; when there is an element of cognitive challenge within the task; and when they understand that learning mathematics is worthwhile, valuable, and useful both within and beyond the classroom. It is easy to mistakenly think that students are engaged when they appear to be busy working, or ‘on task’. True engagement is much deeper than ‘on task’ behaviour, rather, it can be viewed as ‘in task’ behaviour, where all three elements; cognitive, operative and affective, come together. This leads to students valuing and enjoying school mathematics and seeing connections between the maths they do at school and the maths they use in their lives outside school (for more information see my FRAMEWORK FOR ENGAGEMENT WITH MATHEMATICS). As this time of year it is easy to design mathematics tasks that promote high engagement and have the potential to stimulate learning. The following is a set of problem solving activities based on the famous Christmas Carol, The Twelve Days of Christmas. The activities are suitable for children in the middle years (grades 5 to 8), however can be easily adapted to suit younger or older learners. The maids give a 10% when booked for more than two consecutive days. What would their new fee be? All of the above activities have the potential to promote high levels of engagement at a time of year when it is difficult for students and teachers to remain focussed. However, it is important to remember that any activity is only as good as the teacher implementing it. To enhance students’ engagement and learning, ensure there is regular student reflection, and rich discussion about the mathematics embedded with the tasks. A few months ago I posted a blog about ability grouping in the mathematics classroom. I am re-posting the blog here because the beginning of the school year is the perfect opportunity to set up routines and strategies that will promote mathematical learning and ensure the diversities of your new class group are addressed. I strongly recommend flexible grouping in mathematics and I hope this post causes you to think about how you will be grouping your students in 2016. During the primary years students either experience mathematics lessons within mixed ability classrooms or are ability grouped across or between grade levels. In mixed ability classes and to a lesser degree in ability grouped classrooms teachers often have to cater for a range of students whose previous attainment varies considerably. The gap between low and high achievers is said to increase as students progress through school, with as much difference in performance within year levels as there is between Years 5 and 9 students overall (State of Victoria Department of Education and Training, 2004). This concurs with findings by The Middle Years Numeracy Research Project (Siemon, Virgona, & Corneille, 2001) that cites teachers in the middle years can and should expect a range of up to seven school years in numeracy-related performance. Australian TIMSS and PISA reports show our middle years students, when compared to students in other countries, are not keeping up with some aspects of mathematics (Lokan, Greenwood, & Cresswell, 2001). Among the strategies teachers implement in order to cater to the diverse needs of the classroom is the use of ability grouping and the incorporation of differentiated tasks. Although there are arguments both in favour and against the use of ability grouping, it is not uncommon for primary and secondary schools in Australia and internationally to use such grouping in mathematics classrooms. The following is an exploration of both arguments. Clarke (2003) maintains teachers need to think carefully about reasons for choosing to place students into groups according to perceived ability. Teachers need to consider the potential impact upon students’ self-esteem, and the ‘self-fulfilling prophecy’ (Brophy 1963, as cited in Clarke, 2003), in which students perform to the level expected of them by their teacher. He concludes that ability grouping is used in mathematics for teacher convenience more than for student benefit. This is a sentiment echoed by Boaler, Wiliam and Brown (2000), who also believe ability grouping is one of the main sources of disaffection. Ability grouping, such as that which is common in Australian secondary schools, became the focus of a study conducted in the United Kingdom (Boaler, et al., 2000). The grouping of students into ability ‘sets’ emerged as a significant factor that influenced students’ ideas, their responses to mathematics, and their eventual achievement. The study found that students in the school that used ability grouping were significantly disadvantaged by their placement and this disadvantage was not restricted to students in the lower ability groups. Approximately one-third of students in the highest ability groups felt disadvantaged because of high expectations, fast-paced lessons and pressure to succeed. Students from a range of groups were ‘severely disaffected’ by the limits placed upon their attainment. Students reported that they gave up on mathematics once they discovered their teachers had been preparing them for examinations that gave access to only the lowest grades. Large numbers of students, in the study by Boaler et al., experienced difficulties working at the pace of their particular class. For some the pace was too slow, resulting in disengagement, although for others it was too fast, resulting in anxiety. Both responses led to lower levels of achievement. In addition to the findings above, there is research that claims ability grouping causes behavioural problems for some within the mathematics classroom. Teachers in a study conducted by Ventakatakrishnan and Wiliam (2003) found behavioural problems more common in mixed ability groups than in their fast-track, higher ability group. These behavioural problems were compounded by the weak literacy skills of some individuals in these groups in addition to peer self-management skills. Interestingly, placing students in ‘tracked’ groups had an effect on students’ perceptions of themselves as learners of mathematics. Those who were fast-tracked perceived themselves as ‘doing well’ while those in mixed ability groups perceived themselves as ‘low’ in mathematical ability. The teachers involved in the study also noted they had problems motivating the higher attaining students within the mixed-ability groups – students who had ‘just’ missed out on being placed in the fast tracked group. Ventakatakrishnan and Wiliam also note that mixed-ability grouping decreases the opportunities for higher-achieving students to interact constructively with peers although ability groups have the same effect on lower achieving students. The study found that advantages of grouping by ability are limited and restricted to higher achieving students while causing disadvantage to those who are the lowest attainers. Although there are advantages and disadvantages in grouping students according to ability, it is also reasonable to expect that a result of such grouping is differences in teacher expectations and instructional techniques. There is a tendency for instruction in lower ability groups to be of a different quality to that of higher ability groups (Ireson & Hallam, 1999). There appears to be a concern that instruction in low ability groups is conceptually simplified with a higher degree of structured, written work, as in the traditional method of teaching mathematics. Higher ability classes appear to include more analytic, critical thinking tasks with pupils allowed greater independence and choice along with opportunities for discussion, reflecting a more contemporary style of mathematics lesson. Based on stereotypes and past experiences, some teachers hold low expectations for low ability groups, further decreasing students’ own expectations and self-esteem, and leading to decreased levels of engagement with mathematics (Ireson & Hallam, 1999). At the primary level classroom, research suggests students in mixed ability classrooms display more positive attitudes towards school in general (Ashton, 2008; Ofsted, 2008). However, the more common practice of ability grouping in the secondary mathematics classroom is a complex issue. Although it appears to perpetuate the inequities associated with mathematics and the notion of mathematics being an elitist subject, it is often an attempt to address the needs of all students as well as the needs of mathematics teachers. So what is the answer? Again, my advice is to group flexibly. There are circumstances that require children to be grouped by ability, and other circumstances where it is more appropriate and beneficial for students to work in mixed groupings, where students can learn from each other. Another reason to have flexibility is that often children may excel in one area of mathematics, but may be challenged in other areas. Those who appear to struggle, may not necessarily struggle with all concepts. The key is knowing your students and their needs across all aspects of the mathematics curriculum, and ensuring that assessment of students’ ability informs teaching and the way students are grouped. And finally, have high expectations of all students! Boaler, J, Wiliam, D, & Brown, M. (2000). Students’ experiences of ability grouping: Disaffection, polarisation and the construction of failure. British Educational Research Journal, 26(5), 631-649. Ireson, J., & Hallam, S. (1999). Raising standards: Is ability grouping the answer? Oxford Review of Education, 25(3), 343-358. Lokan, J., Greenwood, L., & Cresswell, J. (2001). 15-up and counting, reading, writing, reasoning. How literate are Australia’s students? The PISA 2000 survey of students’ reading, mathematical and scientific literacy skills. Melbourne: ACER. Ofsted. (2008). Mathematics: Understanding the score. London: Ofsted. Siemon, D., Virgona, J., & Corneille, K. (2001). Final report of the middle years numeracy research project. Melbourne, Victoria: RMIT University and the Department of Education and Training (Victoria). Venkatakrishnan, H., & Wiliam, D. (2003). Tracking and mixed-ability grouping in secondary school mathematics classrooms: A case study. British Educational Research Journal, 29(2), 189-204. Thanks for the iPads, but what are we supposed to do with them? This blog was originally posted back in November 2012, on the UWS 21st Century Learning site. It was written when iPads began to appear in schools. We’ve come a long way since then in terms of the increasing popularity of iPads and other tablet devices. However, I wonder how much has changed in relation to the way they are being used to teach and learn primary mathematics? I thought it would be interesting to revisit this post, so I have adapted it slightly to contextualise it into 2015. The fast pace of technology development has seen a rapid uptake in mobile technologies such as the iPad computer tablet. Although not originally intended for use within educational settings when introduced in 2010, the iPad has fast become the ‘must have’ item in today’s classrooms. One result of this is that teachers are often expected to integrate iPads or similar technologies into teaching and learning without the support of appropriate professional development, particularly in relation to using the technology to enhance teaching, learning and student engagement. While some claim iPads and other similar mobile devices have the potential to revolutionise classrooms (Banister, 2010; Ireland & Woollerton, 2010; Kukulska-Hulme, 2009), there is still little research informing teachers exactly how the iPads can be integrated to enhance learning and teaching, and whether their use will have a long-term positive impact on student learning outcomes. So what do we do when we are given a set of iPads and told to use them in our classrooms? Early during the iPad ‘revolution’ I conducted two research projects investigating how iPads were being used to teach and learn mathematics in primary classrooms. These projects gave me the opportunity to observe a variety of pedagogies and make some interesting observations regarding practical issues relating to the management of iPads. In each of the projects, teachers had been provided with iPads for their classrooms with little or no professional development that related to integration into teaching and learning practices. The teachers involved experienced a ‘trial and error’ process of using different strategies to integrate the iPads into their mathematics lessons, a task they found harder to do than with other subject areas. The iPads were used in a wide variety of ways that appeared to have differing levels of success. The success of each lesson was determined by the observed reaction to and the engagement of the students with the set tasks and the teacher’s reflection following the lesson. Several lessons that incorporated iPads utilised a small group approach where students worked either independently or in small groups of two to three students on an application that was based upon the drill and practice of a mathematical skill. The challenge with this approach was that it was difficult for the teacher to know whether the students were on task, if there were any difficulties, and whether the chosen application was appropriate in terms of the level of cognitive challenge. Often when this pedagogy was implemented it was done so without student reflection at the conclusion of the lesson. Without discussion of the mathematics involved in the task, students did not have the opportunity to acknowledge any learning that occurred. The pedagogies that appeared most effective were those that were based on using the technologies to solve problems in real-world contexts. When used this way, the iPads were used as tools to assist in achieving a set goal, rather than as a game. An example of one of these lessons was in Year 5, when students were asked to plan a hypothetical outing to the city to watch a movie. The children were able to use several applications on their iPads ranging from public transport timetables to cinema session time applications to plan their day out. The lesson resulted in rich mathematical conversations and problem solving, and high levels of engagement due to the real-life context within which the mathematics was embedded. The integration of interactive whiteboards with iPads was also a common element in the observed lessons, illustrating how such technologies can enhance teaching as well as learning. In several instances teachers projected the iPads onto interactive whiteboards to demonstrate the tasks set for the students. In other examples, it was the students’ work on the iPads that was projected for the purpose of class discussions and constructive feedback. The variety of ways in which the technologies were used demonstrated their flexibility when compared to traditional laptop or desktop computers. All of the teachers involved in both projects found it challenging to integrate the technologies into mathematics in contrast with other subject areas such as literacy. This challenge led to the teachers expressing a need for professional development in relation to integrating the iPads into existing pedagogical practices and a desire to have a platform from which ideas can be shared amongst peers. The incorporation of the iPads led to the teachers becoming more creative in their lesson planning and as a result, tasks became more student-centred and allowed time for students to investigate and explore mathematics promoting mathematical thinking and problem solving. Overall, the use of iPads appeared to have a positive impact on the practices of the teachers and the engagement of the students participating in the projects. Benefits of the iPads included the flexibility in how and where they could be used, the instant feedback for students and the ability for students to make mistakes and correct them, alleviating the fear of failure and promoting student confidence. The disadvantages of the iPads were mostly management issues relating to the sourcing and uploading of appropriate applications, the difficulties associated with record-keeping and supervision of students while using the iPads and the number of iPads available for use. The interactive nature of the technologies was engaging for the students at an operative level. However, when the tasks in which they were embedded did not include appropriate cognitive challenge, students were less engaged and became distracted by the technologies. The incorporation of iPads in the two projects emphasised their potential to increase student engagement and the importance of providing professional learning experiences for teachers that go beyond learning how to operate the technologies. Rather, continued and sustained development of teachers’ technological pedagogical content knowledge (TPACK) (Mishra & Koehler, 2006) that builds on their understanding of mathematics content, ways in which students learn, the misconceptions that occur, and ways in which technology can enhance teaching and learning is required. References: Banister, S. (2010). Integrating the iPod Touch in K-12 education: Visions and vices. Computers in Schools, 27(2), 121-131. Ireland, G. V., & Woollerton, M. (2010). The impact of the iPad and iPhone on education. Journal of Bunkyo Gakuin University Department of Foreign Languages and Bunkyo Gakuin College(10), 31-48. Kukulska-Hulme, A. (2009). Will mobile learning change language learning? ReCALL, 21(2), 157-165. Mishra, P., & Koehler, M. J. (2006). Technological pedagogical content knowledge: A framework for teacher knowledge. Teachers College Record, 108(6), 1017-1054. Teaching with tablets: Pedagogy driving technology, or technology driving pedagogy? If you are a teacher, then you have probably experienced the introduction of a new technology into your classroom at some point in time. Whether it was an interactive whiteboard, laptops or tablets, it is likely that you would have felt some pressure to use that technology as much as possible because of the expense involved. Often teachers are expected to incorporate new technologies without the support of appropriate professional development. That is, professional development that not only addresses the technical aspects of the devices, but the pedagogical considerations as well. My research into the use of iPads in primary classrooms has revealed that many teachers find it a challenge to use technology creatively to teach mathematics when compared to other subject areas. I believe that the way technology is used in mathematics lessons often reflects how the teacher views and understands mathematics and the curriculum. The teachers who see mathematics as a collection of facts and rules to be memorised often rely on a drill and practice approach, and therefore limit the use of technology to applications that support this method. The plethora of drill and practice apps now available on tablets help perpetuate this teaching method. On the other hand, teachers who see mathematics as a collection of big ideas that need to be applied to rich, contextual activities are the ones who use tablets and other technologies in more creative ways, steering away from the mathematics specific applications. Often during the drill and practice approach, the technology becomes the focus of the lesson. However, when rich tasks are involved, the focus remains on the learning and the technology is used as a tool to promote the learning, access and present information. So how can you make your use of technology more meaningful in mathematics lessons? 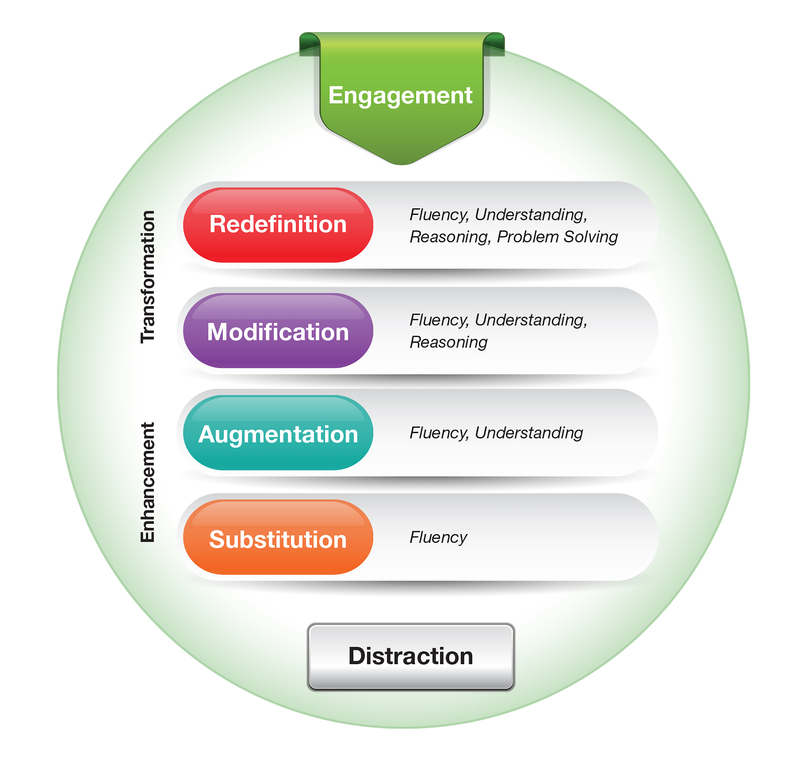 Frameworks are often helpful in encouraging teachers to reflect on their practices, and one that is a good starting point is the SAMR model of technology integration by Puentedura (2006). The model represents a series of levels of technology integration, beginning at the substitution level, where technology simply acts as a direct substitute for traditional practices, with no improvement. The second level, augmentation, provides some functional improvement – imagine the use of a maths game app that gives instant feedback. The feedback component is the improvement. At the third level, modification, the technology has allowed for significant redesign of existing tasks. The final level, redefinition, allows us to create new tasks that were previously inconceivable. I believe that we should be pushing ourselves to aim for the redefinition level of SAMR, however, this does not mean that technology should not be used at the lower levels. The most important thing to remember is that you must not let the technology determine the pedagogy – it should be the other way around, where the pedagogy is driving the technology. Another thing to think about is that no framework is perfect. Although the SAMR model is a good starting point, a major flaw is that it assumes that any use of technology is going to enhance teaching and learning. I disagree. I have seen lessons where the technology distracts students, and the focus is no longer on the mathematics: it’s on the technology. Technology driving pedagogy. Apart from adding a ‘distraction’ level to SAMR, I would also like to suggest that consideration of student engagement sits as a backdrop behind the entire model. I would also want to consider how the proficiencies (Working Mathematically) align with the model. In the graphic below you will see that I have made some additions to SAMR, suggesting that the lower levels of the model align with the proficiency of fluency, and as you progress through the model, more proficiencies are added so that tasks that move beyond drill and practice promote understanding, problem solving and reasoning. From: Engaging Maths: iPad activities for teaching and learning, Attard, 2015. This adapted model can be used as a tool to help plan and design tasks and activities that incorporate technology. On the other hand, it might help you make the decision to not use technology! Resist the temptation to use devices simply because you feel you have to – if it doesn’t enhance teaching and learning, don’t use it. If you are going to use those drill and practice type apps, then make sure they are embedded in good teaching – always include rich reflection prompts that provide children with the opportunity to talk about the mathematics involved in the task, the problems and challenges they encountered, and ways they can improve their learning. Remember, don’t let the technology drive the pedagogy – mathematics and learning should always be the focus! Attard, C. (2015). Engaging maths: iPad activities for teaching and learning. Sydney: Modern Teaching Aids. This week my new book, Engaging Maths: iPad Activities for Teaching and Learning, was published so I thought I would write about some of the thinking behind the book, which provides a range of teaching and learning ideas based on my research on student engagement and the effective use of mobile technologies. As a teacher educator, I was very excited by the introduction of iPads back in 2010 and the prospect of using these devices to teach primary mathematics. Having been a primary school teacher for some years before beginning my career as an academic, I sensed that many teachers would be dazzled and distracted by the number of applications (apps) available for use (particularly in mathematics). I was keen to investigate how the tablets were being used in classrooms, particularly as there appeared to be little or no professional development opportunities relating to the pedagogical considerations involved in using the devices, due to their newness. So I conducted two research studies, each six months long, in two different schools where iPads were being introduced (Attard, 2013; Attard & Curry, 2012). I investigated the ways teachers used the devices in their mathematics lessons and I spoke to teachers and students about their perception of iPads. Not surprisingly, the introduction of the iPads did seem to result in higher levels of student engagement. Another benefit described by the participating teachers was that the students had begun to engage with mathematics more at home. They did this by downloading the same apps that were being used in their mathematics lessons. The teachers involved in both studies recognised that iPads hold the potential to enhance mathematics teaching and learning due to their wide range of affordances that include a vast variety of applications, ease of use, and their ubiquitous nature. However, they found it challenging to incorporate creative iPad use into mathematics lessons when compared to their integration into other subject areas such as English and science. During the course of the two studies, the teachers tended to rely on apps that are specifically designed for mathematics, but focused on a drill and practice approach that simply replaced the repetition of a standard worksheet or textbook page with some added animation and colour. Sometimes the apps that were used in the observed mathematics lessons were based on games, with little or no opportunity for students to develop their problem solving skills or being able to reflect on their learning, and limited opportunities for the teachers to capture evidence of learning. These challenges could have been addressed with the support of professional development and an opportunity to share ideas with other teachers. As one teacher stated: “it’s probably about having that conversation with other teachers.” It must also be acknowledged that at the time of the studies, iPads were a very new technology and professional development relating specifically to iPads and mathematics was not readily available and perhaps is still not sufficiently available five years after their introduction. Having said that, professional development opportunities should not simply focus on specific devices. Rather, due to the rapid pace of technology development, they should be focused on understanding the pedagogy related to the incorporation of any type of technology, and the development of teachers’ Technological Pedagogical Content Knowledge (Koehler & Mishra, 2009). Although my new book has the word ‘iPads’ in its title, the theory underpinning the ideas and strategies apply to any technology, and in fact, any new resource you are considering using. The activities within the book can be adapted to suit different devices, different content, and a diversity of learners. More importantly, the book is intended as a form of professional learning for teachers struggling with finding meaningful, creative and powerful ways to use technology to enhance the teaching and learning of mathematics. Remember, don’t be distracted by bells and whistles: technology is only as good as the pedagogy driving it – careful consideration must be taken to ensure the focus remains on the learning, rather than on the technology. Attard C., & Curry, C. (2012) Exploring the use of iPads to engage young students with mathematics, In J. Dindyal, L. P. Cheng, & S. F. Ng (Eds. ), Mathematics Education: Expanding Horizons. (Proceedings of the 35th annual conference of the Mathematics Education Research Group of Australasia), pp 75-82. Singapore: MERGA. Koehler, M. J., & Mishra, P. (2009). What is technological pedagogical content knowledge? Contemporary Issues in Technoogy and Teacher Education, 9(1), 60-70.